Il Campari is a lovely restaurant as far as the décor and atmosphere are concerned. It is beautifully furnished with lots of highly polished wood, attractive brass light fixtures, and pristine white table cloths with gleaming glass and silverware. Carafes of good quality olive oil are placed on each table and, though I had no wine on this particular evening, the ‘cellar’ was visible from my table and the collection was quite impressive. The establishment would seat at least a hundred or so patrons but I arrived just after 5pm and had the pace to myself for the whole of my stay. My waiter, accordingly, was able to focus on me exclusively but I am fairly confident that he would be as efficient and helpful if the place were full. He quite knowledgeable about the menu, clearly liked discussing the various dishes, and was otherwise friendly and attentive. 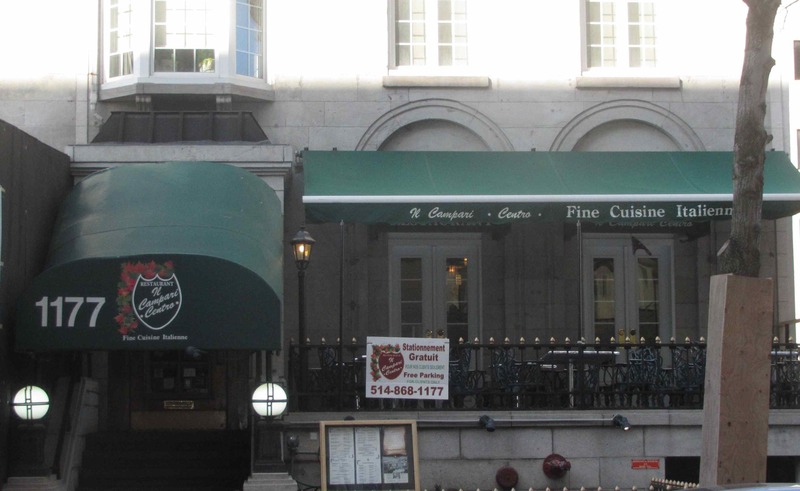 The menu at Il Campari has many classics and, like most of the Italian restaurants in Montreal, does a fair number of veal dishes. 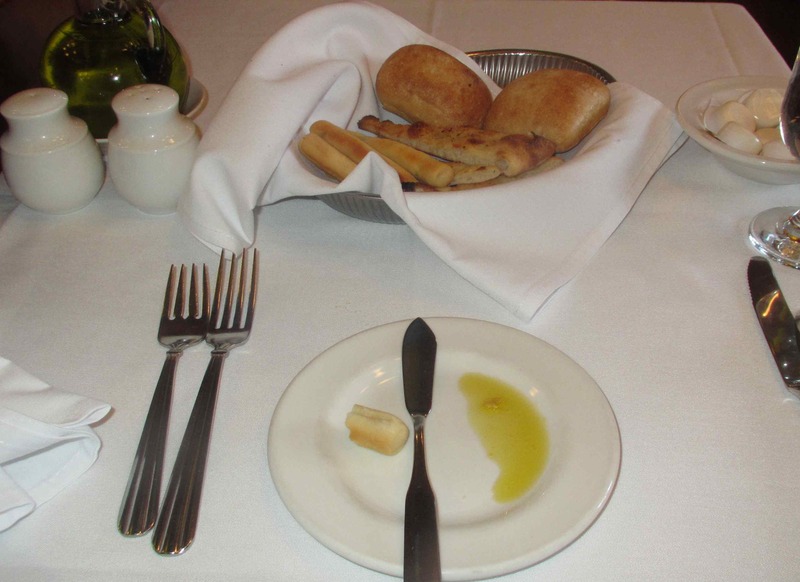 After I was seated, and whilst I perused the menu, my waiter brought me an attractive bread basket containing fennel-flavored breadsticks, plain rolls and a lovely herbed focaccia. Butter was supplied but, instead, I used a little my olive oil and a little salt. When my waiter saw this he offered to bring me a little Balsamic vinegar as well but the oil was lovely by itself and I declined. 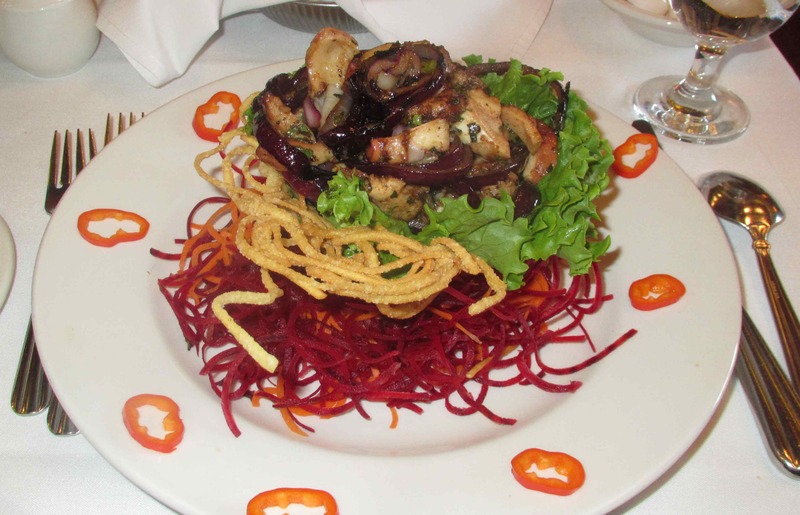 Grilled Octopus Appetizer – When I looked at Il Campari’s online menu, I had originally decided to try the Beef Carpaccio but I saw the Octopus and decided to give it a try. Unfortunately, although the presentation was very good, it turned out to be the least enjoyable of all the octopus dishes I have ever had. The chunks of meat were served with carmelized onions in a fried potato straw basket and there were garnishes of finely shredded carrot, beet and sliced chili. The octopus, however was really mediocre and the onions rather woody and not very sweet at all. The overall flavor was bland, without the usually pleasant texture I enjoy in octopus and, to be honest, I would probably be hard pressed to guess I was eating seafood at all. It was very disappointing indeed. Rating: 1 out of 5. 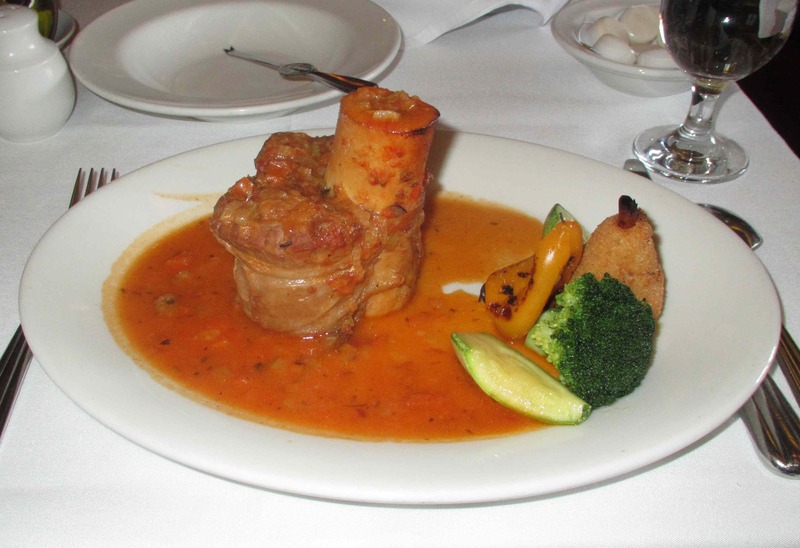 Osso Buco alla Milanese – I was very torn between this dish and Veal Picata a Limone for my main course but Osso Buco is one of those dishes I have seen countless recipes for but have never tried. Again, however, I was less than overwhelmed by the result and ended up wishing I had gone for one of the veal preparations instead. The shank was not cut as a flat cross-section as is usually the case but was rather a lengthy piece of bone with a good deal of meat still attached. The sauce was tomato based, with a little carrot and onion, but there was a taste that was unusual. Frequently, the dish is enhanced with a little gremolata (which contains lemon zest) but here I fancied I could taste a hint of orange. I queried my waiter about this and, after checking with the kitchen, he confirmed that orange zest had indeed been added. I honestly can’t find much to complain about the dish (other than the potato croquette, which had a ‘warmed-over’ taste) but on the whole it was very unexciting and not nearly as good as my wife’s usual pork-hock supper which is decidedly rustic and a very cheap meal indeed. For an ostensible upscale (and pricey) restaurant, I was expecting a bit more. Rating: 2 out of 5. It sounds a little like a bad joke but I have to say that Il Campari would likely be a great restaurant if it wasn’t for the food. The ambience is lovely, the service impeccable, but the meal I had on this occasion fell far short of my expectations. Still, I am prepared to give the benefit of the doubt and say that, maybe, I just happened to catch the place on a bad night. That being said though, I don’t feel compelled to rush back any time soon. Rating 2 out of 5. Methinks this would have received firm ‘thumbs down’ fro me !! I did not taste the octopus, but my very beloved osso buco simply does not look even vaguely like this! Better luck next time!!!!!! My only other experiences of Osso Bucco involve a slice through the shank, not the ‘hock’ shaped piece I was served… very curious.